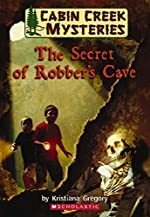 Review: The Secret of Robber’s Cave is written by Kristiana Gregory. This is the first book in the Cabin Creek Mysteries series. This book has you join the lives of three young children and all of their acquaintances. David is one of these children; he is 10 years of age, 2 years younger than his older brother Jeff. David loves to draw and is very outgoing but can prove to be unprepared at crucial moments. Jeff is the older brother of 10 year old youngster David. Jeff is always prepared and always has his father’s wishes for him and his brother in mind when doing any activity that is reminiscent to their father who passed away in a fatal avalanche. The third member of this small group of children is David and Jeff’s intelligent cousin Claire. Claire is always prepared and has a great sense of right and wrong. Claire will do her best to be polite and prove very useful and even life saving in this story. You are walking through the forest on an afternoon that once seemed cheerful but is now filled with gloom as clouds fill the sky. You stumble over something and you soon realize it is a human foot. You gasp in disgust and poke at the foot with a stick. You decide to wander around the island some more. In future days you find a cave and discover a human skeleton that is missing a foot. You remember stories of the Silver Spur Bandit and wonder if the newspapers had been mistaken, after all the Silver Spur Bandit was said to have escaped to this precise island and he was missing a hand. This is not an uncommon thing for Jeff, David, and Claire to encounter. They risk their life to try and solve the mystery of the Silver Spur Bandit day after day. Will they ever find the treasure or will they just doom themselves to a gruesome death? Overall this book was fantastic! It had the perfect amount of suspense: being trapped in caves, avoiding a dangerous storm, finding human body parts and so on. It holds you in its grasp, keeping you there reading for hours. The emotions in this book were very well stated and accurate for the ages of each character: 10 and 12 year olds becoming easily frightened, at times abbreviating words in ways adults would not and elders saying things like “that’s ding-dong for sure.” Any location the group went to was always described very well, from the rocks underfoot to the clouds above. The characters fit perfectly into this story and were often quite entertaining in their behavior and method of comedy. I think this book would not be appropriate for very young children to read due to some gruesome findings and scenes; for example human remains and skeletons. Although there was one more thing that I did not like about this book -- some things were hard to grasp or understand like how a foot could be shot clear off. Naturally anyone who loves mysteries and a good book to read every once in a while would love this book! Review written by Tiffany, Grade 6. Date of review: June 2009.